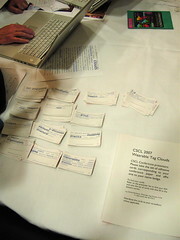 Here are some images of TagCrowd being demonstrated at the International Conference on Computer-Supported Collaborative Learning (CSCL) in New Brunswick, NJ. (Click on the photo to see the rest). I created word cloud stickers for every presenter at the conference (all 147 of them) based on the title and abstract of the article they wrote for the conference. There just happened to be a space on everyone’s conference-provided name badge that was the perfect size for the stickers so it was easy for people to display them. I distributed the stickers throughout the conference and you could see people pointing and referring to them whenever they introduced themselves. It was fun to instigate this at such a large scale. Next time I’ll try to work with the conference organizers directly instead of trying to distribute them all on my own. I sure met a lot of people that way, though! Neat idea! I enjoyed seeing it at CSCL. Since you catered it towards academics, at least at CSCL, I was thinking you could try to create a stop list and link it to delicious tags so that researchers could easily find other delicious accounts that might be of interest.